How To Restart, Shutdown Mac Faster From CLI? Very Easy. From GUI We gracefully Restart, Shutdown Mac OS X 10.x as non-root user from GUI. Basically for running hundreds of daemons, which are installed by Apple as member of UNIX Wheel Group delays the force shutdown and Forced Restart. OS X is cocktail of FreeBSD and NetBSD, but even with 12GB RAM, we have to do lot of works to make Mac to Shutdown faster. 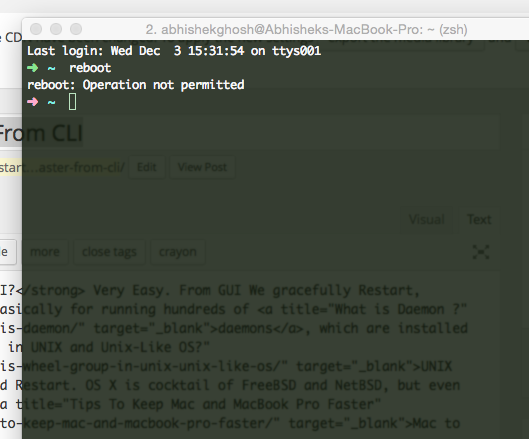 How To Restart, Shutdown Mac Faster From CLI : Careful ! Be careful, you must know at least about Terminal, Command Line, some commands of Unix Like OS. We must read the manual of each command by running man used in this guide. This is not an alternative way to GUI based restart, shutdown. These must be used judicially, keeping in mind – for forced restart, no active opened files will be saved. If you were having a session with sudo privilege, naturally, sudo need not to be added. Both are unix functions. Steve Jobs has zero contribution to these functions. You can write a bash script to make it faster, executing the sh will work. Basic thing to understand – the GUI part of Mac OS X Yosemite is too heavy and poorly integrated with unix system. You can actually recompile the OS and use with some other graphical environment, it is quite difficult, hence iTerm2, Homebrew are so much praised. If you try to recompile the OS, Apple applications will be difficult to run. That is said, but actually many HP-UX users use Homebrew! This Article Has Been Shared 7675 Times! Automator is an automation software designed by Apple for Mac computers running OS X. It allows to automate using provided basic scripts or one can add own. How to Flash Apple MacBook Superdrive to Make Region Restriction Free With Patched Firmware. Sometimes the Patch Fixes the Continuously Rejecting Disks. Cite this article as: Abhishek Ghosh, "How To Restart, Shutdown Mac Faster From CLI," in The Customize Windows, December 3, 2014, April 23, 2019, https://thecustomizewindows.com/2014/12/restart-shutdown-mac-faster-cli/.